Here's the next two then - and i'm leaving well alone. 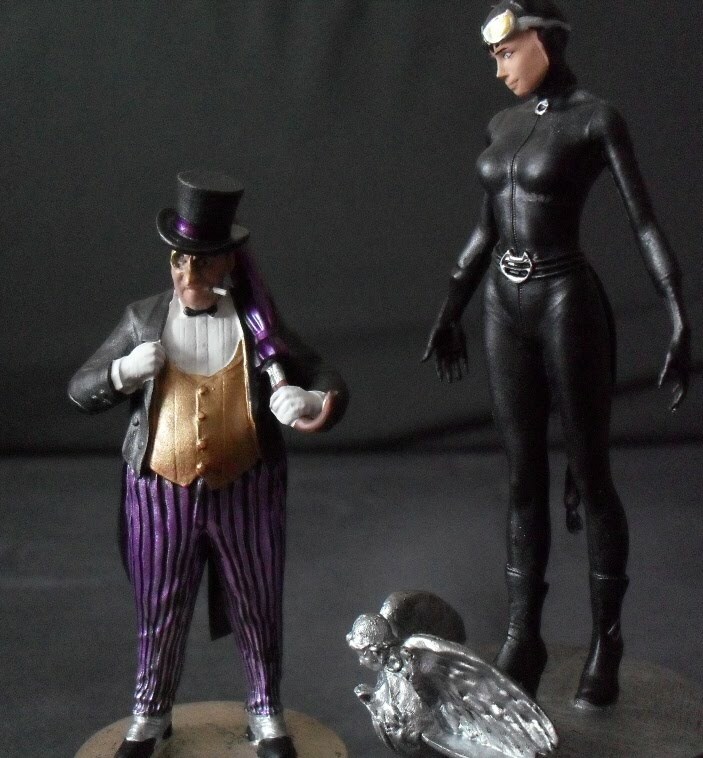 Catwoman is pretty much perfect and an excellent sculpt, with her really only needing some lipstick. The lenses of her goggles are the only bit that's the crappy metallic, but it works on them. Penguin has more of the metallics about him - trousers, umbrella, hat - but he's such an outlandish and garish character that they're kinda in keeping so are staying. Lovely work on the face here too. First off, fine job on your touch-ups of the other characters. I especially liked your color choice with Batman. Seeing how successful your chess pieces turned out, I plan to do the same type of process that you did. Can you give any general advice on the work you've done, and also some specific recommendations, such as, what sort of product to use and which specific colors you used? I've never colored on metal before, but your results are just too phenomenal for me not to imitate. I just realized, it's resin, not pewter, but I would still like to know what your method was. Hi Anthony, and many thanks for your kind comments. Re repainting the figures, i just go over the existing colours without priming them first - they act as a decent basecoat as is. Regarding work done, that differs from figure to figure. With most of them i've left the flesh tones as is, and just re-done the parts of the costume that are in the hideous metallic finish. Batgirl was a bit different in that the gold parts had to be changed to yellow, and yellow is notorious for being translucent no matter what brand of paint you may use. So i chose to paint those bits white first before carrying on. Two Face is proving to be the most complex so far as not only does both parts of his suit need changing, but all the acid-scarred too. Re brands of paint, that really can depend on where you are. And if there's specific recolouring points you need pointers on, just let me know here.